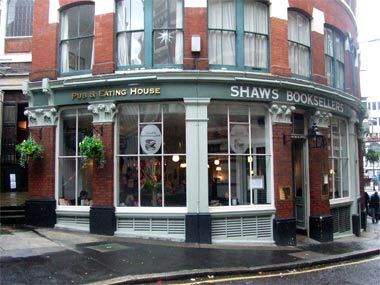 This interestingly named Fullers pubs can be found on St. Andrews Hill just off Queen Victoria Street, up the hill is the Cockpit and down the hill is the Cos Bar both offer an interesting pint in their own way, but Shaws Booksellers offers that gastro experience coupled with excellent ale. There are plenty of seating either side of the bar and the whole place has a light and fresh airy feel. Service is swift and pleasant, and it is possible to sit at the bar and enjoy a pint of London Pride or Discovery. But the majority of the clientele are enjoying the find food which is available. Don't be mistaken, this is a modern styled pub, with a restaurant serivce for food. St Andrews Hill was formally called Puddledock Hill because it led to Puddle Dock, near the present Mermaid Theatre. When the construction of Queen Victoria Street we completed in 1871 the hill was renamed after the church of St Andrew by the Wardrobe, which stood on the side of a hill, on the northern side of Queen Victoria Street. The church was destroyed in the Great Fire of 1666, Wren rebuilt the church between 1685 & 1695. but it was gutted by German bombs in 1940, though it has now been completely restored by Marshall Sisson.